A lot of weight is indeed being put on the sat pings. I hope the engineers have thoroughly checked for latency issues or time stamp errors to ensure everything is as it seems. There are a lot of protocol levels in that system. I am no satellite expert however I know that GPS satellite engineers adjust for the effects of the warping of space and time due to earths gravitational field. So looking at the contents of the satellite ping packet for a time stamp would be trivial for professional satellite engineers. Following thread closely since first 50 pages, but haven't seen mention of what exactly the Malaysian military did when they were tracking this a/c on their radar, now we know they were tracking it? I remember v early on an official during a presser said they don't scramble jets normally to civilian a/c because they are not normally deemed a threat. This was said, however, before they released the information that they had been tracking the a/c by military radar. Obviously people may be overstating the "on call" capabilities of Malay airforce in the middle of the night. But surely, 4 hours after lost contact, unidentified a/c spotted on military radar- they must have done something? And how did they know from the radar that it was MH370, in the first place? JR Barrett's point (post 4068) on selective use of the HF Radio for communication is very helpful if we're running with the theory of the biggest heist ever (cargo of gold?) or some form of sinister hijack for future purposes (post 4075). We need to remember that no one had any idea of the concept of 9/11 before it happened. Truth can sometimes be more astonishing than fiction. ANA1936, thanks very much for the circles. 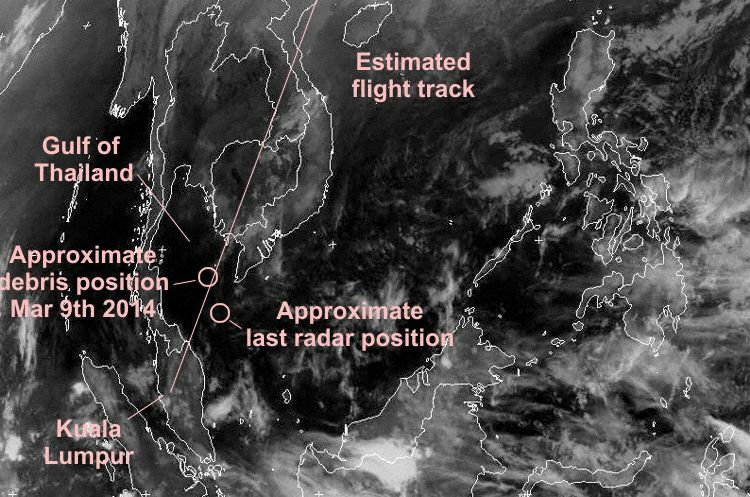 There are enough satellite pings to determine likely locations where the plane would have been pinged but stayed off radar the entire time it was in flight. I agree. Plus the search along the northern route (land) will be much easier to check and rule out. Planned and unplanned attempts but is turning the aircraft round and flying in the opposite direction for many hours until it ran out of fuel typical suicidal planning behaviour? I don't think it is. Could it be Uyghur related terrorism against China? And the recent 29 stabbing deaths at a Chinese train station was Uyghur related. This would make sense if the large Chinese population onboard and the plane's destination were a factor. Or it could be a smokescreen by someone for some other purpose. The uptick in Uyghur terrorism in the past few years should raise some questions though, in relation to this incident. As most birds are "bent pipes" and generally connect the incoming RF signal to an onboard transmitter on a coresponding downlink frequency, any doppler shift present in the uplink one should be present in the downlink one. Now the trigonometry suggests a tiny or even undetectable doppler shift, but this would be larger at the extremes of a beam's footprint. Any thoughts? Whats the big deal about the non standard R/T terminology? seriously? routine usage of nonstandard words in locally acceptable language is a norm.... Namaste is used in Indian airspace by all airlines... as is bye or Khuda Hafiz in other areas.... whats the big deal? at this point 7 hours on in daylight, the fuel remaining would be very low. If it had been flying 7 hours between loss of contact and the ping on the arc, the southern arc would seem too close wouldn't it? Assuming it had been flying in a straight line it could easily have gone as far as Perth?? The far end of the Northern Arc makes more sense time wise? I'm sure that's true, but it depends on there actually being data to supply, I would think? Given what we've learned from all this, there seems to be patchy alertness and coverage in that part of the world. Anecdotal evidence is that Myanmar can be overflown without challenge. However, it is really sloppy software to generate superfluous pings. If there is not data to transmit, then there is no reason to waste battery power and bandwith to see which server could take your call if you had a payload to send, like a sign on request. Not if you look at it from the standpoint of the vendor who is selling a subscription service to monitor engine data during cruise. They would want the connection to be robust and available without the customer having to configure anything if they did purchase the package. A check ping every 30 mins is not overkill in this case. The ping also includes the aircraft's digital unique identifier (like a MAC address), so the vendor could activate the service instantly from their server side. But it sounds like very few folks were aware of the pinging--it was kinda hidden away in the software. Edit: The pings originate from the Inmarsat satellite system ACARS server, not from the ACARS software on the plane and are sent hourly to check the Satcom connection. Yes, commercial line pilots use "Roger that". All the time. ATC and commercial pilots say it regularly. The range for the first ping after last radar contact can show which direction is most likely. The range of that arc will put the aircraft either closer or further away from the radar that had previously tracked them. Which airfields, capable of taking a 777 are there in Turkmenistan etc? Suppose the hijackers just want the aircraft? How likely is it that the aircraft could make it to a former Russian Republic airfield and land without comment from locals? Where would it have been dark at points near maximum endurance? Because look how much people are taking about it, speculating, how focused the world is on it. Terrorists love publicity and this is giving to them in bucket loads even if the actual people haven't announced themselves. That is of course assume it is an act of terror. Personally I'm subscribing to the idea of 'we don't know and won't know until we have more evidence' side. I'm not sure there is such a thing as 'typical suicide planning behaviour'. From my own exposure to the subject, suicides can get themselves 'into position' and then take a long time to commit themselves to the final act. And I can imagine that letting the place run out of fuel and crash, in some ways might make it into an accident rather than suicide in a distorted mind.